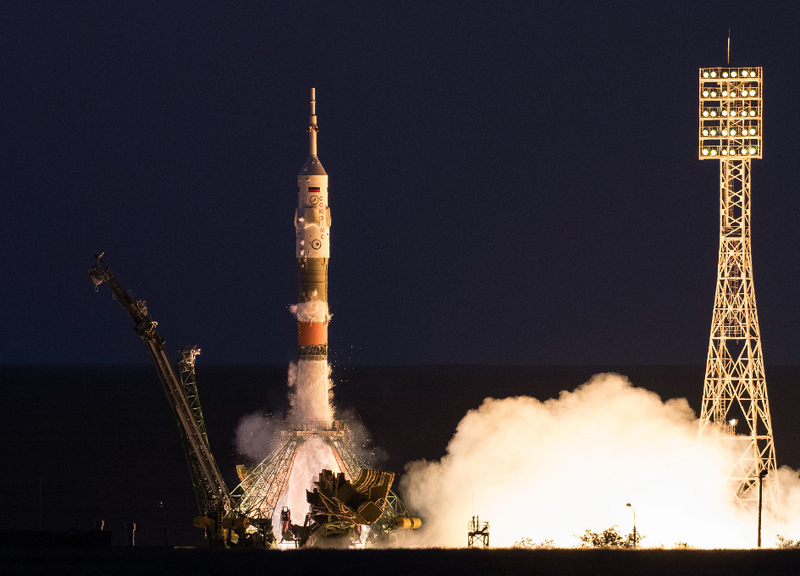 Soyuz Launches to the International Space Station With Expedition 52/53 Crew. The Soyuz MS-05 launched from the Baikonur Cosmodrome in Kazakhstan to the International Space Station at 11:41 a.m. EDT Friday, July 28 (9:41 p.m. in Baikonur). About four minutes prior to launch, the space station flew over the launch site and was flying about 250 miles above south central Russia, just over the northeast border of Kazakhstan, at the time of launch. NASA astronaut Randy Bresnik, Sergey Ryazanskiy of Roscosmos and Paolo Nespoli of ESA (European Space Agency) are now safely in orbit. The crew will orbit Earth four times en route to the spacecraft's arrival and docking to the space station's Rassvet module, at 6 p.m. Tune in at 5:15 p.m. to NASA Television or the agency's website to watch the docking live. The Expedition 52 crew will conduct new science investigations arriving on SpaceX's 12th NASA-contracted commercial resupply mission targeted to launch in August. Investigations the crew will work on include a study developed by the Michael J. Fox Foundation of the pathology of Parkinson's disease to aid in the development of therapies for patients on Earth. The crew will use the special nature of microgravity in a new lung tissue study to advance understanding of how stem cells work and pave the way for further use of the microgravity environment in stem cell research. Expedition astronauts also will assemble and deploy a microsatellite investigation seeking to validate the concept of using microsatellites in low-Earth orbit to support critical operations, such as providing lower-cost Earth imagery in time-sensitive situations such as tracking severe weather and detecting natural disasters.